29-Aug-2013 -- This is visit 4 in a series of 7 CP visits while on a short road trip with my son Michael from 28 to 30 August 2013. Again an uneventful drive to our next CP. This one however would not be as easy as the last one. Following the navi we were thwarted about 4 km from the CP, about 2 km from the CP as the crow flies, by road works. Determined to make this CP, we parked the car and headed off on foot. Initially following an easy trail through the woods we then left the existing trail to head directly towards the CP. This was steep difficult terrain, through the trees, then along a ridge. Steep and hard work. Eventually we crossed a trail which we followed towards the CP but eventually this veered away from the CP and this time it was steep down through the trees. 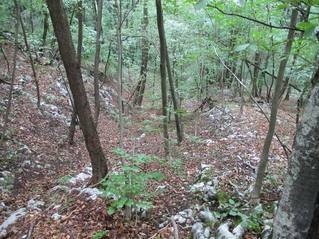 It got steeper still and we seemed to be descending down a dry river bed - but probably not dry after a thunder storm. The steepness was beginning to worry me - I had visions of one of us tumbling down the slope. So at about 66 metres we called it a day. Back at the roadworks the workers were gone. This did not matter - we had had a good walk and having completed this CP meant we had now done the whole of Slovenia. This was Michael's second complete country after Luxembourg, and my third complete country after Luxembourg and Austria.